An international team of researchers including members of the Max Planck Institute of Colloids and Interfaces has discovered a self-sealing mechanism in the seed pods of Banksia plants: special waxes in the junction zone between the two pod valves melt at elevated environmental temperatures and thereby seal small fissures. Bush fires can cause destruction – but at the same time create new life: many species of the genus Banksia commonly found in Australia require heat in order for their seeds to be released from the pods. Since fires occur at irregular intervals, the mature seeds often remain in the two-valved pods for long time periods – up to 17 years in some species. During this long period of time, the seed pods are constantly exposed to environmental challenges. This can cause tiny cracks where moisture or pathogens enter with the risk of destroying the seeds. Scientists at the Max Planck Institute of Colloids and Interfaces in Potsdam, in collaboration with colleagues at TU Dresden, the University of Natural Resources and Life Sciences, Vienna, and Kings Park and Botanic Garden, Western Australia, showed how the plant protects the seeds: special waxes between the two valves of the seed pod that melt at elevated environmental temperatures ensure that these tiny openings are effectively sealed. The study conducted by the researchers focused on three different Banksia species: Banksia serrata occurs in the east of Australia, while B. attenuata and B. candolleana are common in the south-west. The genus Banksia includes many species of evergreen trees and shrubs. The inflorescences are made up of numerous individual flowers which are pollinated by insects, birds or marsupials. 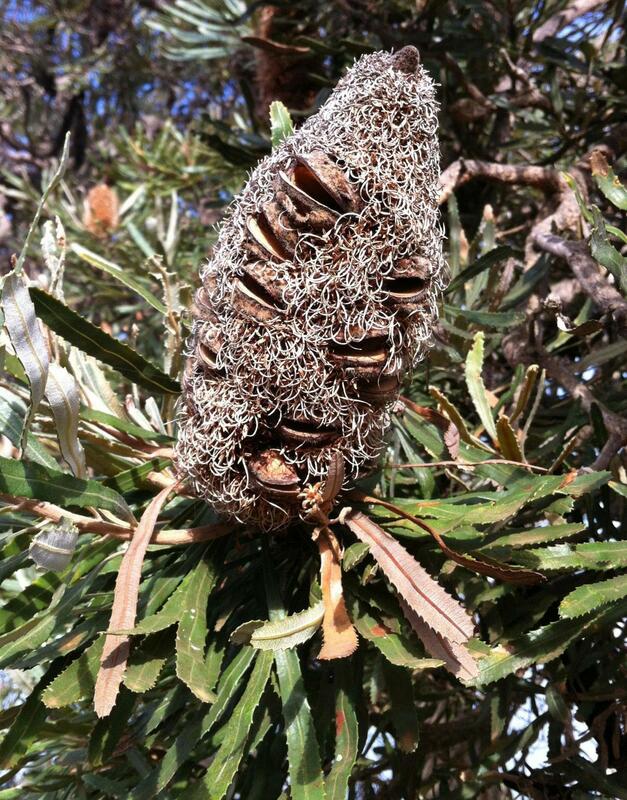 The seed pods of many species require very high temperatures for opening, eg caused by bush fires. Until recently, it was unclear how this temperature-related opening mechanism works: "It was commonly thought that the two valves of the seed pods were held together by resins that melt when heated, thereby opening the valves," says Jessica Huss, doctoral student at the Institute in Potsdam and first author of the study. "But in the junction zone between the valves we detected waxes rather than resins." In order to achieve a detailed chemical characterization, the researchers analysed the substances by means of Raman spectroscopy. Further investigations revealed that the waxes melt between 45 and 55 degrees Celsius, while the seed pods didn't open until temperatures of between 54 and 76 degrees Celsius were reached. This was a clear indication that the waxes were not triggering the opening of the valves. In a previously published study, the researchers put forward evidence that the opening mechanism is based on the mechanical properties and differing orientation of the cellulose fibres in the tri-layered pod. "The tissue dries while the seed ripens," says Jessica Huss. "During this process, the fibres shrink to differing degrees, thereby creating pre-stresses." Heat softens the innermost pod layer thereby releasing the pre-stresses and causing the two halves of the seed pod to split open." But what are the functions of the waxes if they are not relevant for the opening mechanism? "Since the seeds remain on the plant for extremely long periods of time in some Banksia species, with the pod permanently exposed to UV radiation, heat and rain as well as the beaks of hungry birds, we assume that the waxes perform a protective function," says the scientist. "In many regions of Australia, temperatures of 45 to 55°C are not unusual in sun-exposed areas during the summer: the waxes melt on hot days and in this liquid state they are able to repeatedly seal small fissures." Based on a simple model, the researchers tested whether such waxes are in fact capable of sealing fissures in wood. They used small panels of pinewood which they covered with a thin layer of carnauba wax and then applied cuts. They subsequently caused the wax to melt on some of the wood panels. A staining test showed that the liquid wax had effectively sealed the cuts within just 15 minutes: while it was possible to stain the cavities in the panels that hadn't been heated, those in the heated panels resisted staining. "The demonstrated self-sealing mechanism is probably a widespread adaptation in the Banksia genus," says Michaela Eder. "Such a self-sealing temperature-based system might be interesting for applications, e.g. for dimensionally stable wood in outdoor structures." Jessica C. Huss, Oliver Spaeker, Notburga Gierlinger, David J. Merritt, Ben P. Miller, Christoph Neinhuis, Peter Fratzl, Michaela Eder Published 20 June 2018.